According to the National Bureaus of Statistics of China (NBSC), the industrial profits of enterprises above designated size from January to November amounted to RMB 5,538.68 billion, a Year on Year (YOY) decrease of 1.9%. In November, the industrial profits of enterprises above designated size achieved RMB 672.08 billion, a YOY decrease of 1.4%, and the pace of decline narrowed by 3.2 percentage points over October. 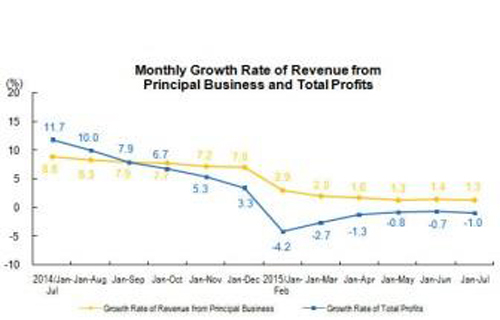 In the first 11 months of 2015, the revenues from principal business of enterprises above designated totaled RMB 99,506.64 billion, increased by 1.0% YOY. The main business cost was RMB 85,544.87 billion, up by 1.1%. Within 41 branches of industrial divisions, the industrial profits of 29 industrial divisions increased compared to the same period of last year, that of 1 kept at the same level, and that of 11 decreased. Specifically, the profits of processing of food from agricultural products increased by 10.1% YOY; that of manufacture of chemical raw material and chemical products increased 8.3%; that of manufacture of motor vehicles increased by 0.6%; that of manufacture of electrical machinery and equipment increased by 14.5%, that of manufacture of computer, communication equipment and other electronic equipment increased by 8.9%; that of manufacture of rubber and plastics products increased by 5.4%.